Tim Howlingcrane, an enrolled member of the Southern Cheynne and Arapaho Tribes of Oklahoma, is a direct descendant of both Chief Black Kettle and Howling Crane. He is a well-known Northern Traditional Dancer with a reputation for winning many competitions. 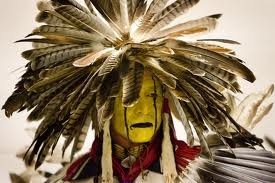 Using knowledge he acquired from creating his own regalia, he has begun designing similar items for others. Chokers, breastplates, beaded bags, armbands and cuffs are just some of the items he enjoys making. These medicine bags and chokers illustrate his proficiency with the fine beadwork the Cheyenne are known for and if you look elsewhere in our store, you will find other pieces of jewelry he has designed and executed. He occasionally works with his wife, Bonnie, who, although not tribally recognized, can trace her ancestry through the Cherokee back to Pocahontas and before that, the Powhatan Tribes in the 1400s. Self-taught, she creates stunning earrings and a variety of beadwork.